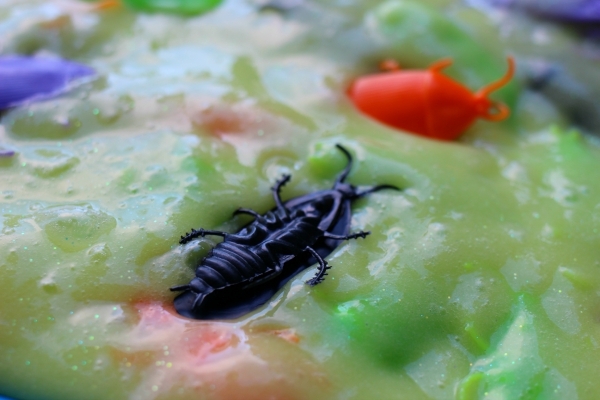 We LOVE slime and when I was at the store picking up milk I saw these cockroaches, nothing like checking out at the grocery store with a gallon of milk and 50 plastic cockroaches. What the checker didn’t know was that I had a plan for those cockroaches and this is it! Halloween is all about fun and my daughter and I decided that monster eat slime and bugs so we called this monster stew. 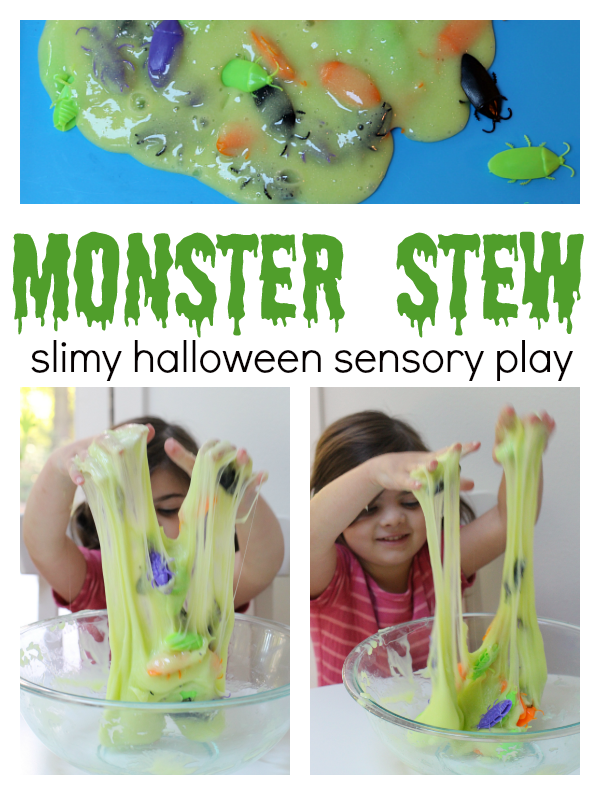 Kids relate well to cooking and sensory recipes like this are recipes too so you can cook up some monster stew for Halloween… just don’t eat it! 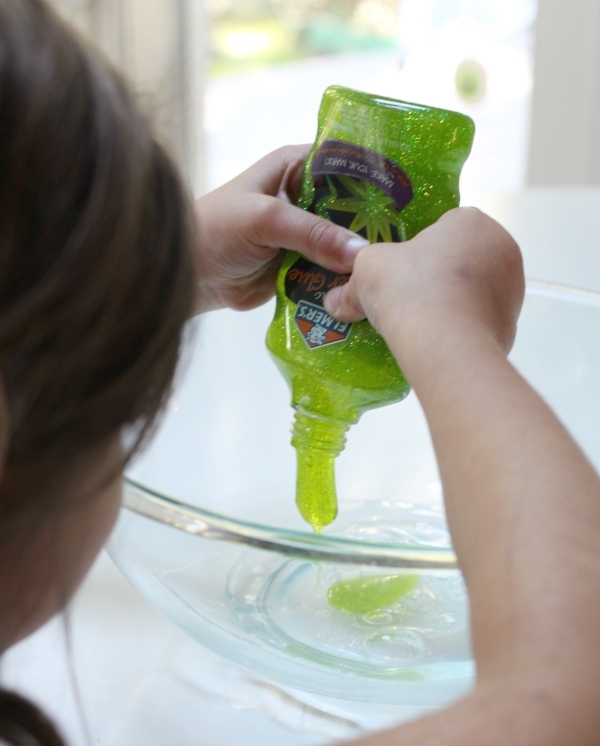 Slime is a fun sensory material and kids love playing AND making it. 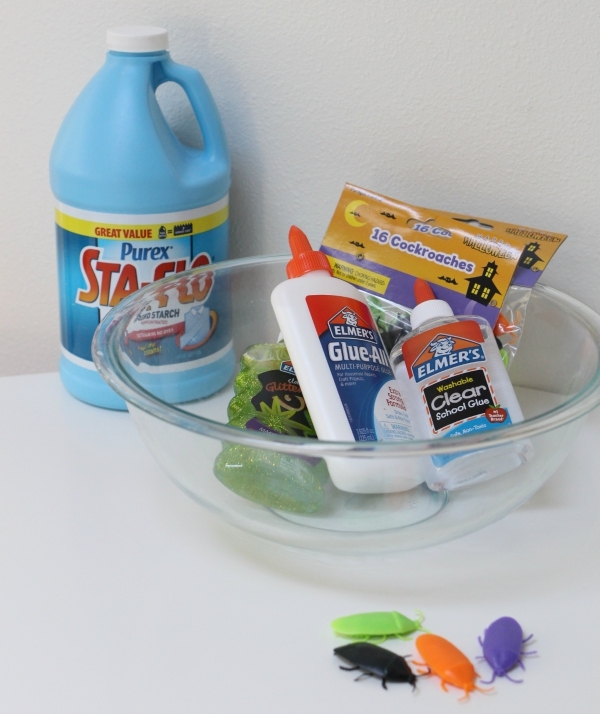 Here is our recipe ( we like ours pretty thick) for Halloween sensory play. Gather your materials. 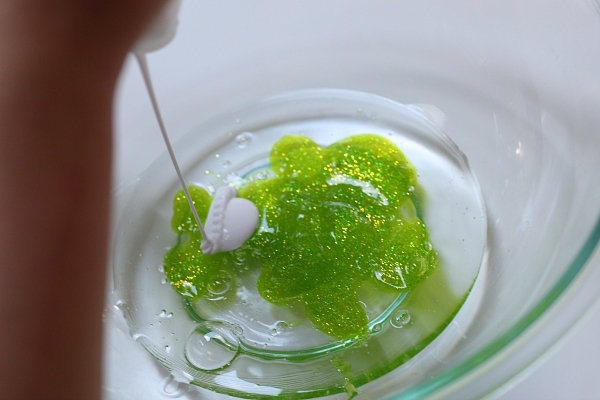 You will need a bottle of green glitter glue, a bottle of clear glue, and a dash of white glue. You will also need liquid starch and some plastic bugs! 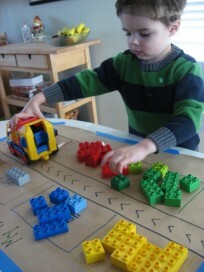 You’ll also need a big bowl, a tablespoon, big spoon and tray for playing. 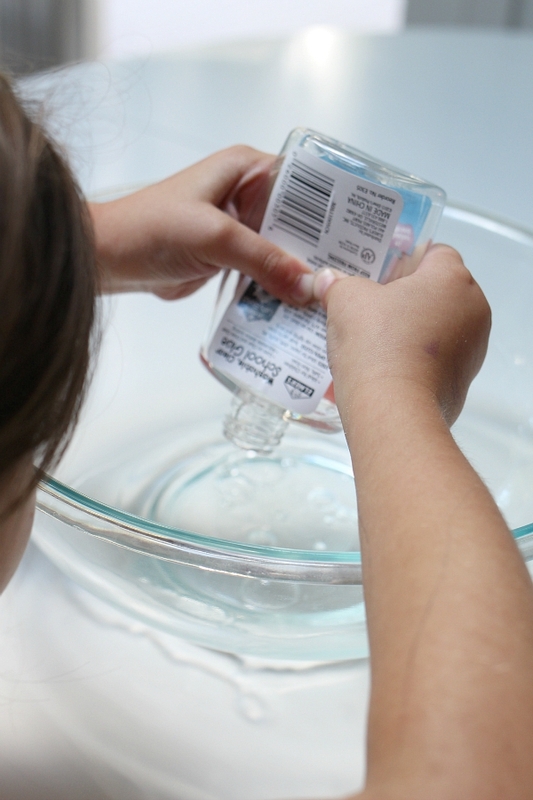 Start by pouring your clear glue into a bowl- the whole bottle. A dash of white glue. Add 9 tablespoons of liquid starch. Less if you want it more liquidy. Knead, knead, knead! 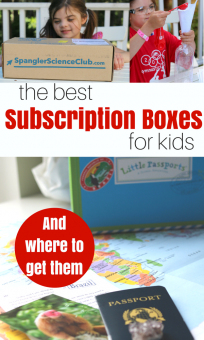 Books lists include affiliate links. 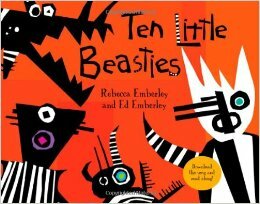 Ten Little Beasties by Rebecca and Ed Emberley is a simple book that you will sing along with. It is a re-make of the song 10 Little Indians with a Halloween twist. 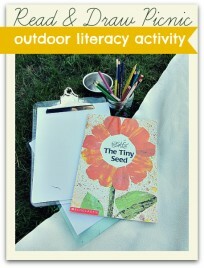 The illustrations steal the show and I bet your kids will want to count/ sing along every time you read! 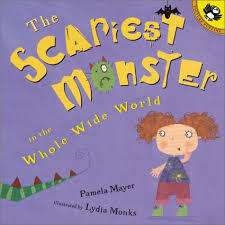 The Scariest Monster in the Whole Wide World by Pamela Mayer should be required reading for every dance/cheer/hockey mom or dad. This is a GREAT story about how sometimes parents don’t hear what kids want and just plow ahead with their own plans convinced that their kids are into it. This book is for every kid who got an elaborate birthday party when all they wanted was cake. A little girl wants to be a monster for Halloween, but her parents are a little obsessed with winning the costume contest and don’t hear her. Luckily Grandma saves the day and I love that the little girl gets to express herself and not just what her parents wanted in the end! 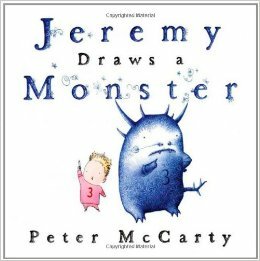 Jeremy Draws a Monster (Jeremy and the Monster) by Peter McCarty is a story about a little boy who has isolated himself in his room and one day draws himself a monster. The monster doesn’t really turn out the way he wants but as he is sending the monster off on a bus he finds himself outside and is asked to play. Sometimes it takes a bad imaginary friend ( or monster) to get you ready to make real friends. Next Post: Letter Sounds Tray Activity – with familiar foods! 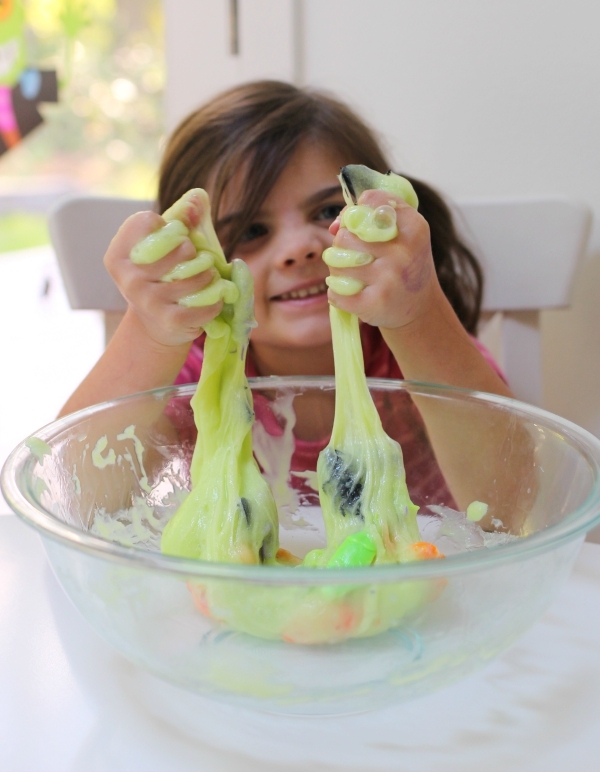 What kid wouldn’t love to play in slime that looks like boogers 😉 This looks so fun and perfect for Halloween!! Maybe I should have called it Monster boogers?! Is it possible to substitute liquid starch with something else? 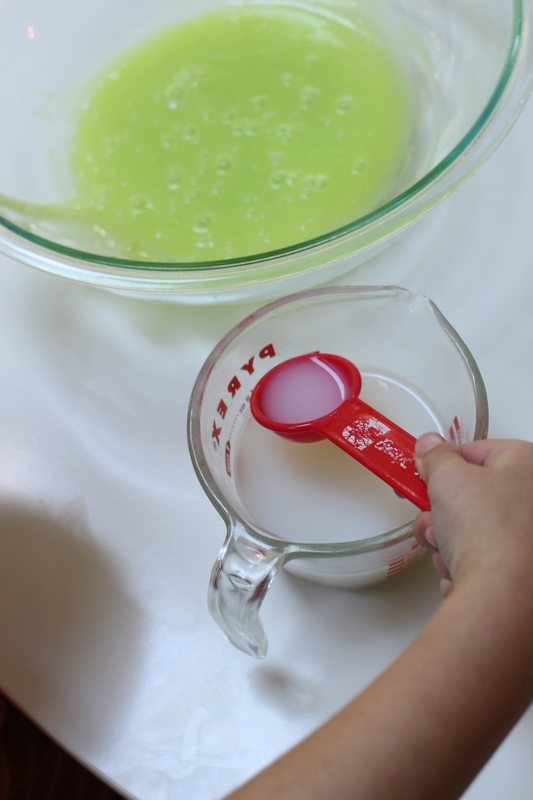 There are some different recipes for slime , some use borax, some use fiber supplement, but let me find some for you! About how much does this yield? I need enough for 14 kids in my son’s pre-k class. Does it work as well in a tripled/quadrupled batch? I would make 2 batches to play with but if this was for gifts ( individually packaged I would make 3-4 per batch so you would need 4 batches. I would not just make a bigger recipe I would do it in batches, the kneading is easier I think that way. I did it today, it turn out really cool, I call it monster’s soup! The kids engage really good, I put some flies, roaches and ants (I found a really nice ones in Amazon). Do you think you could substitute another bottle of clear glue for the glitter glue, and then just add loose glitter? I’m trying to get enough materials for a whole classroom to do this activity, but the glitter glue is hard to find in bulk (the clear glue is available in gallon containers). I’ve added loose glitter to slime before, so I know that works, but wasn’t sure if the ingredients of glitter glue and clear glue were close enough to not affect the composition of the slime.